Obituary for Catherine T. (Powers) Tebeau | Edwards Memorial Funeral Home, Inc.
Mrs. Catherine T. (Powers) Tebeau, 92, of Milford MA, died Wednesday (October 17, 2018) at her residence after an illness. She was the beloved wife of the late Francis R. Tebeau Sr., who died in 2009 and the mother of the late Francis R. Tebeau, who died in 2013. Mrs. Tebeau was born in Milford MA, the daughter of the late William and the late Mary (McNeil) Powers. 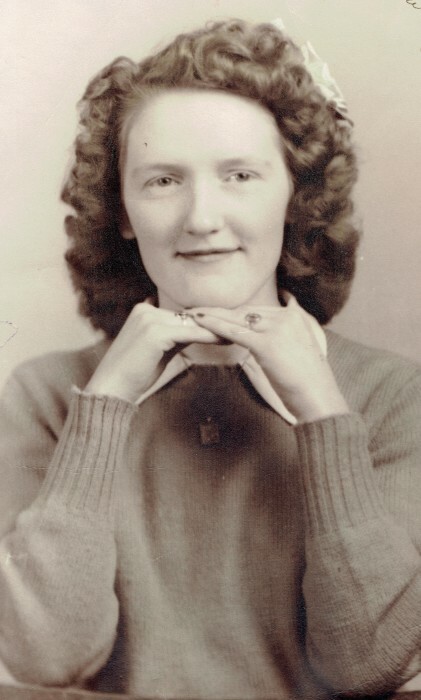 She attended the former St. Mary’s Grammar School and was a graduate of the former St. Mary’s High School, Class of 1945. She also attended school in Worcester to become a nurse’s aide. Mrs. Tebeau had been employed at the former Adin Manor located in Hopedale MA and at the former Medvale Nursing Home located in Medfield MA. She was a longtime communicant of St. Mary of the Assumption Church and had volunteered for years at St. Mary’s schools. She is survived by 2 Sons: Edward J. Tebeau and his wife Susan of Milford MA and John A. Tebeau and his wife Rachel of Milford MA; 5 Grandchildren: Lauren Spencer and James Spencer of Gotha FL, Megan Tebeau, Edward Tebeau Jr., Christopher Tebeau, and John Tebeau, all of Milford MA; 1 Great Granddaughter: Lindsay Spencer of Gotha FL. Her funeral will be held Monday (October 22nd) from the Edwards Memorial Funeral Home, 44 Congress Street, Milford MA followed by a Mass of Christian Burial at 12 NOON in St. Mary of the Assumption Church, 19 Winter Street, Milford MA. Burial will follow in St. Mary’s Cemetery in Milford MA. A visiting hour will be held Monday (October 22nd) from 10:30am to 11:30am, prior to her Funeral Mass. In lieu of flowers, memorial donations may be made to Salmon VNA & Hospice, 37 Birch Street, Milford MA 01757.